Tempered glass stairs – Today, stairs use glass materials always bring a luxurious ,modern and safe for users. Stairs with transparent glass will bring a space of elegance, sophistication and peerage. Can use flexible wooden window handrail stairs, inox window handrail stairs or no handrail. Tempered glass stairs Tempered glass stairs is usually made of toughened glass ( tempered glass) or double-layer safety glue. But, it is often made of toughened glass because of the security and rigidity it brings. 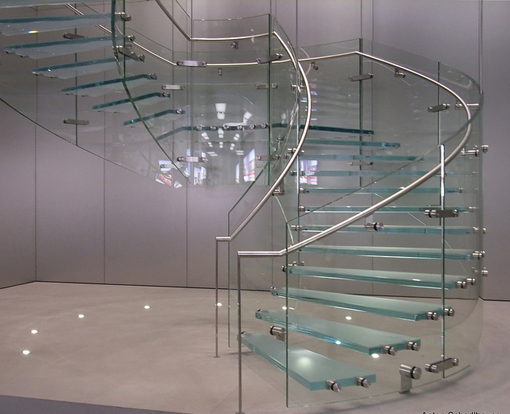 Design and contruction of glass stairs is one of the strengths of Global Invest. With more than 10 years experience and professional team, we have executed many large and small projects to bring confidence and satisfaction to all customers, even the most difficult persons. WHY WE SHOULD USE TEMPERED GLASS STAIRS? – Safety , easy to clean. – Simple but delicate and luxurious. – Visibility is clear, not stifling, helping your home airy and spacious. – Not affected by the hot weather, it makes us feel cool and comfortable. – Durable with time, not afraid of sunshine or rain. – Young and dynamic space, suitable for small area. – High quality, good bearing, almost no additional cost of repair. – Variety of sample code, glass stairs will satisfy all customers. – Stairs handles: Based on space, color, design style of the house to choose the most suitable handrail pattern. Wooden handrails or inox 304 window handrail stairs have always been popular. – Glass: There are two types of glass for stairs: tempered glass and safety glasses. But most people use tempered glass with a thickness of 10- 19mm to ensure the durability and safety of the building. – Double pad, single pad: Made of inox SOS 304 stainless, durable with time base on the design of cylindrical solid, used to flank the stairs of the stairs to bond and create a secure stair glass.